The story of two Londons. "London above" is the London we know. "London below" is a magical realm that exists alongside it. Richard Mayhew stumbles across London below after he rescues a girl and tries to help her escape some hired assassins. Having looked carefully, London below eludes me. Which is totally unfair. Fanny Price is sent to live with her richer cousins, the Bertrams. Although she grows up alongside them, it is always made clear that she is the poor relation. But whilst the Bertrams have money, Fanny has good character. I love visiting Jane Austin's world every so often. I usually follow it up with Murder at Mansfield Park by Lynn Shepherd. Chrestomancis are powerful enchanters with nine lives. Their job is to keep magic in the various worlds balanced. Calling out "Chrestomanci" makes the current one to appear, whether he wants to or not, anywhere in his own world. (Sadly, not this one. Of course I tried!). Once called, the Chrestomanci attempts to solve any urgent magical problem. This is my favourite book series and I read them all at least once a year. Reading them as an adult is different to reading them as a child as you notice little touches and life lessons that Wynne-Jones popped in. 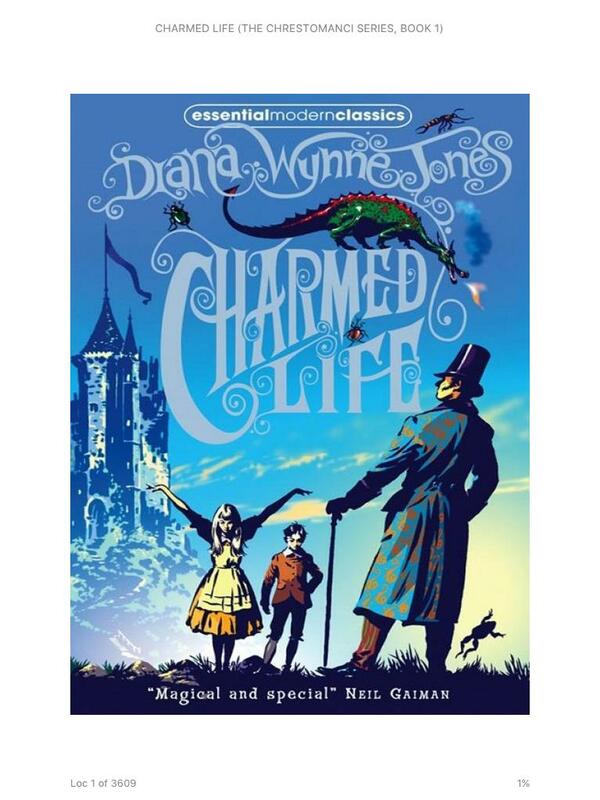 I'm so grateful to Jean, the children's librarian, who made me borrow "Charmed Life". I never looked back. What books do you re-read every so often? I'll have a look, thank you. I know what you mean, I bumped into Jon Pertwee, the third Doctor Who, once and could barely get the words out. I was so cross with myself afterwards! Hope you find something you like :). I love second hand books but tend to read everything on the Kindle now as you can make the print bigger! Oh, a bunch! I've re-read the Harry Potters more times than I'd like to admit to. I've also read The Time Traveller's Wife a few times and I re-read the 'I am Number Four' series when a new one is coming out. I like re-reading books. It's like a comfort blanket to me. I read Mansfield park a long time ago but don't know the other two. I must admit that I am a bit of a chick lit girl but the last book I read and really enjoyed was the minaturist by Jessie Burton. I love reading Michael Crichton books, he's a master. There aren't many books I've read over and over again, but Ben Elton is another author I like. Some of my favourites are State of Fear (M. Crichton), Past Mortem (B. Elton), oh yes, and my guilty pleasure... The Twilight Saga (that would be the books NOT the films!). It's been a little while since I visited Jane Austen's world too - probably time for a revisit. I re-read books when I was younger. Little Women was a favourite and I read Malory Towers and St. Clare's by Enid Blyton more than once. I don't re-read books as an adult, like Little House Lea I find that there are so many books that I still want to read for a first time! I think the TV version spoiled it for me but I may revisit again (in comic form). If I reread a book it is generally in a time of crisis. I remember binge reading the whole of the Sandman series at such a time. My other go to is the brutal tragi-comic majesty of Catch-22. I've got Catch-22 in my pile, I'll move it up :) I've not seen the TV version of Neverwhere and have kept away as some of the other Gaiman adaptions I haven't liked. I don't often revisit books but there's a bunch I like to go back to every couple of years - Notes on a Scandal, The Color Purple, Stuart a Life Backwards are among them. Beauty. Detoxing the Stash. Again!